From left to right: Assistant Superintendent Dr. Marc Natanagara; Superintendent David Healy; Manager of Capital Projects Mark Wagner; Board Member and South Toms River rep Gigi Esparza; Board Vice President and Chair of the Buildings and Grounds Committee Joe Nardini; and Board President and Buildings and Grounds Committee Member Russell K. Corby gather to review the blueprints for High School South’s updated boiler room. 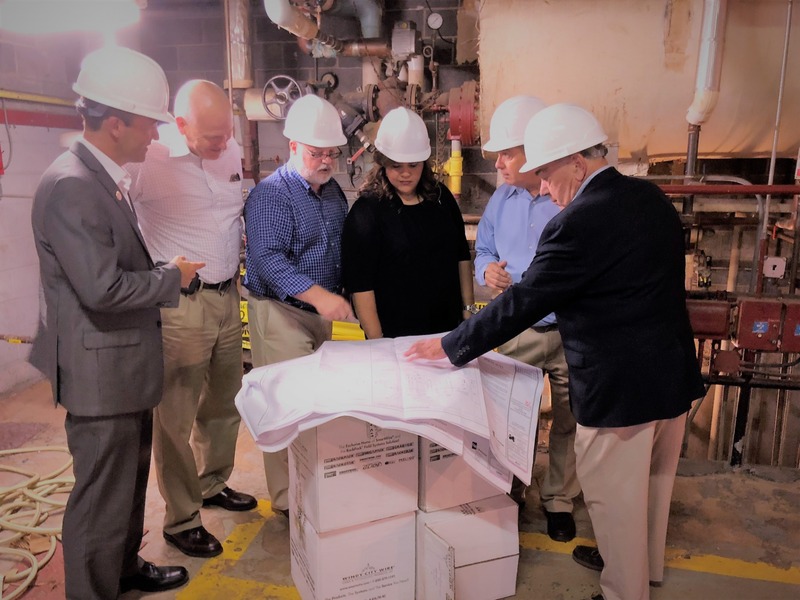 August 24, 2018-- As part of Toms River Regional Schools’ Rebuilding Our Schools Initiative and corresponding ESIP program, old and outdated boilers at High School South are being replaced with five new efficient models. 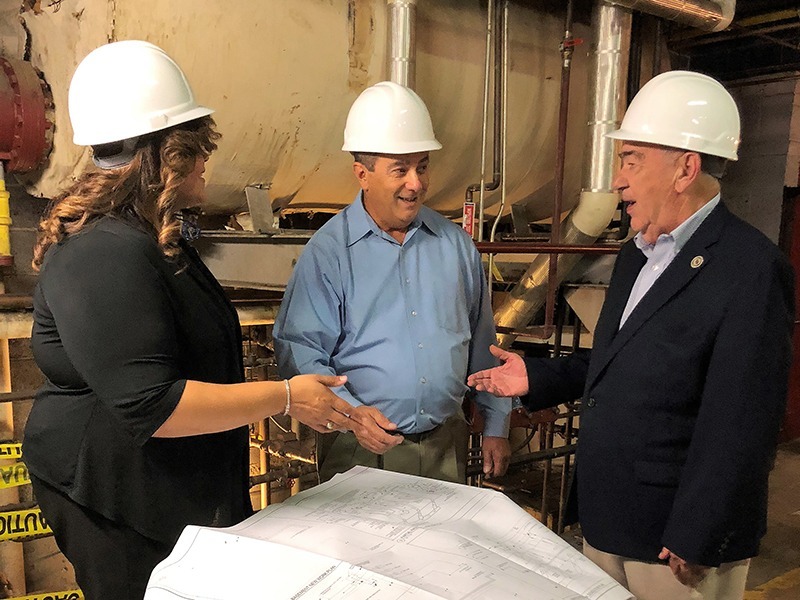 Led by the district’s facilities team including Capital Projects Engineer Mark Wagner and Facilities Engineer Dharm Blatt, the boiler room space has been cleared and readied for installation. 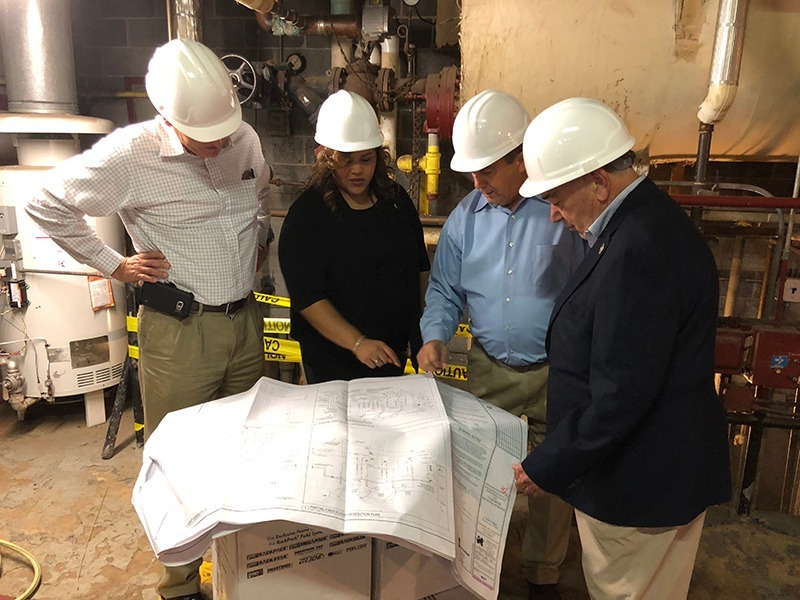 Yesterday, school and district administrators, as well as Board of Education members, met to discuss the progress and review blueprints for the updated boiler room layout. The self-funding ESIP program was vigorously pursued by the district at the direction of the board, and will save Toms River taxpayer’s $17.8 million while implementing necessary upgrades to school facilities. 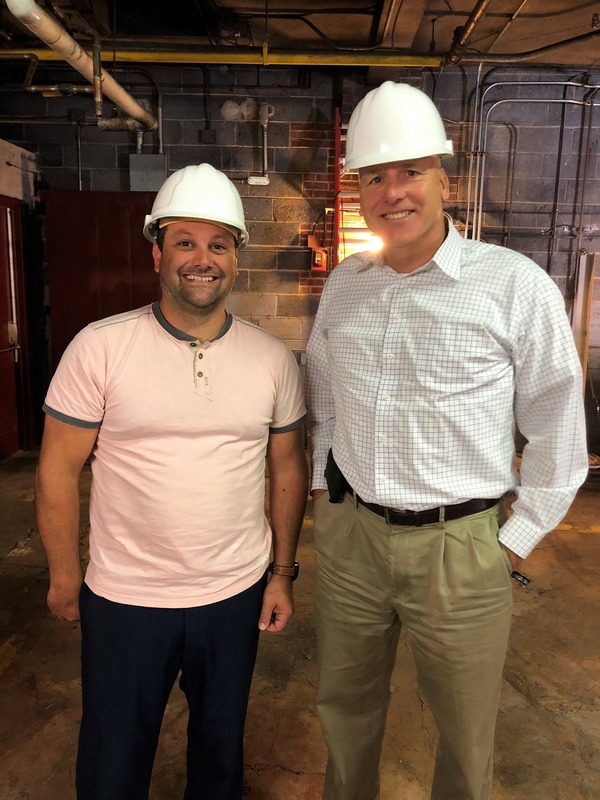 High School South Principal Michael Citta stands with Superintendent David Healy in the school’s cleared-out boiler room space. This is Principal Citta’s first year leading HSS-- the district’s oldest school-- and he will help facilitate energy-efficient projects through ESIP. Board member Gigi Esparza, Board Vice President Joe Nardini, and Board President Russell Corby are all smiles while discussing upgrades to High School South. Superintendent David Healy joins the team to review the project blueprints.